On Lifetime tonight Bring It! airs with an all new Friday March 20, season 2 episode 9 called “Captain Down,” and we have your weekly recap below. On tonight’s episode, the Dancing Dolls travel back to Atlanta, Georgia, for a much anticipated rematch against hometown favorites, the Dazzling Divas. On the last episode, Coach Traci and the YCDT Supastarz returned to Mississippi looking for revenge after losing to Dianna and the Dolls the last time they battled. Meanwhile, Miss D stepped up her game and created one of the most elaborate routines she has ever choreographed, and Selena raised hell after Dianna cut her twin daughters, Star and Sky. Did you watch last episode? If you missed it, we have a full and detailed recap right here for you. Don’t forget to join us for our live recap tonight at 8:00pm when Bring It! airs on Lifetime. While you wait for the recap, let us know what you think of Bring It! 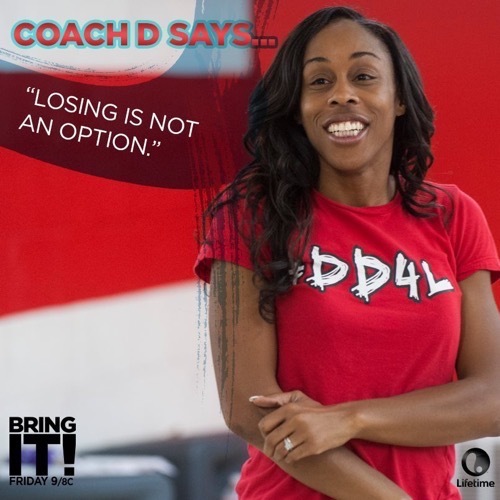 Coming off their devastating loss from last week, the Dancing Dolls are more determined than ever to win. And that’s why on tonight’s all new episode, Ms. Dianna is having her girls dance in two separate categories in their upcoming competition in Atlanta. Yet, if you recall what happened last week then you would know the main problem with dancing in more than one category is that it kind of the team thin. Last week the girls just couldn’t keep it track of it all. They had so much choreography and they had to remember what do for both Creative Dance and Stand Battle. And in the end, all of that got the better of the Dancing Dolls. But Dianna wanted to try doing the Creative Dance and Stand Battle again. Possibly as a way to redeem her team and also this time they’ll be up against the Dazzling Divas. You know the team they beat not that long ago. However, since they’ve beaten the Dazzling Divas, the team from Georgia has gone on to win every competition its entered afterwards. Almost as if they were gearing up to challenge the Dancing Dolls again. So winning in this case is definitely personal. And repeating the same mistake as last time may not be the best decision. What’s going to be holding them back this time is not just the two dances. The girls can actually do that if they put more into it focus. Yet the Dancing Dolls can’t survive without their captain. Kayla injured herself and so she had to sit out during practice. Apparently the pain and injury was so bad she didn’t even try to work through it. And coming from a girl that danced with a broken toe, that’s saying a lot. Though do you know who should stop talking? If you guess Selena then you would be right. Because this week Selena has been pressuring the coach into letting her daughter do the Creative Dance. Sunjai is a senior and next year she’ll be going away to college. So this is her last chance to shine so to speak and for that reason alone – Selena wanted Dianna to put her daughter in the exclusive Creative Dance routine. Dianna was only going to pick five dancers for it and Selena wanted Sunjai to be one of them. Except Sunjai was proven to be not as great of a dancer. So Dianna ultimately had her sit that one out. And for some reason Selena is taking this one personally. Later, during the competition, Selena was still fuming. Particularly as she was watching other women’s daughters doing the Creative Dance. Hence when the Dancing Dolls ended up losing in that category – Selena said it was because her daughter wasn’t in it to make it great enough. And as for the rest of the competition, before they could even do Stand Battle; Dianna had to talk to her captain. It seemed that Kayla’s leg was still bothering her on the day she had to dance and no matter what her mother did in stretching her out backstage – the tightening feeling in her leg wouldn’t go away. So Dianna gave Kayla a choice. She told Kayla she could sit this one out if the pain was too much and yet the captain didn’t want to be left out. Kayla knew she had to lead her team and so she did. All the way to victory. The Dancing Dolls won first place for their Stand Battle and Dianna was both extremely proud of her team and of Kayla. According to Dianna, all the other girls should be taking notes. Kayla is everything a captain should be.